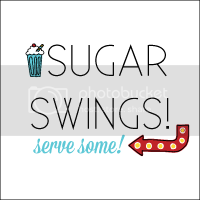 Sugar Swings! 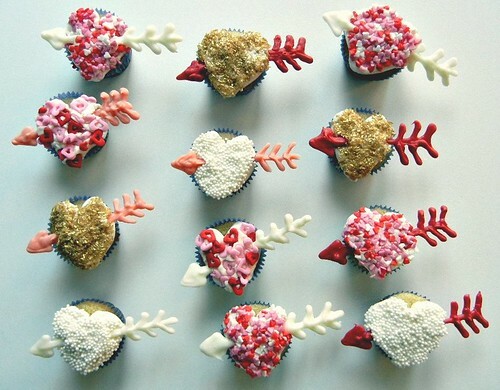 Serve Some: flying heart cupcakes.....! ....and although they do fit in with valentines day...i had my 4 year old girlee girl old in mind when i made these....which are in celebration of her heart day.....on january 16th it will be 4 years since her heart transplant (she and her twin will be 5 in april)....and we've taken to celebrate it as if it's her second birthday...well because it is...! ....and these are also another check-off on my 2012 pinterest to do lists!....i saw this idea awhile back to make heart shaped cupcakes here....by baking with a marble between the liner and pan....neat, right? 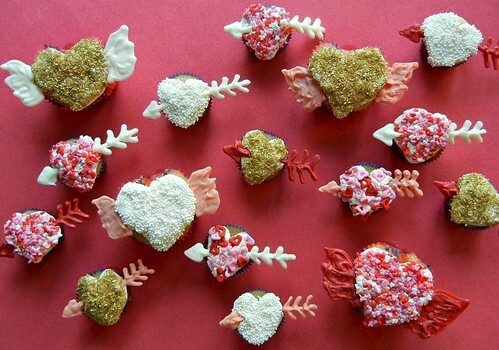 ...and you get some heart shaped cupcakes topped with lots of sprinkles...which are the best kind IMHO.....and of course you can absolutely use these for valentine's day too! I'm really happy to hear stories about the lives of organ recipients. My dad was killed in an accident and many of his organs we're donated. Even through the shock and sadness I still remember being told that his eyes were given to a woman who was finally able to see her two young children. Thank you for sharing your story. thank you and thanks for sharing your dad's story. It's hard to tell sometimes what the donor families think---i'm sure some are happy to hear how their loved ones live on to some degree and for others it may be a reminder. thanks again for commenting! 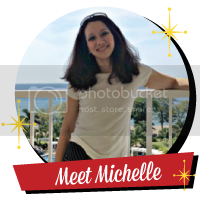 Wow, so amazing Are the lives behind the blogs. I agree organ donation is soooo important. Praying for health and good things for you and yours. 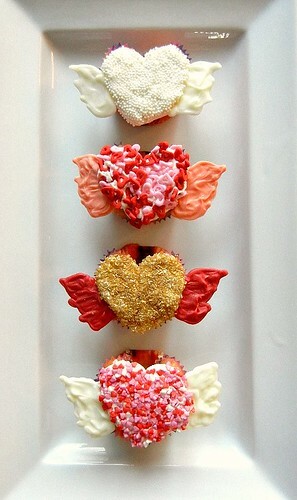 Love the heart cupcakes! Happy birthday and re-birthday! These all look great! Happy heart day to your "Shmoopie", glad she is doing great! These are so cute! I love how you made the hearts. And the sprinkles are fabulous. 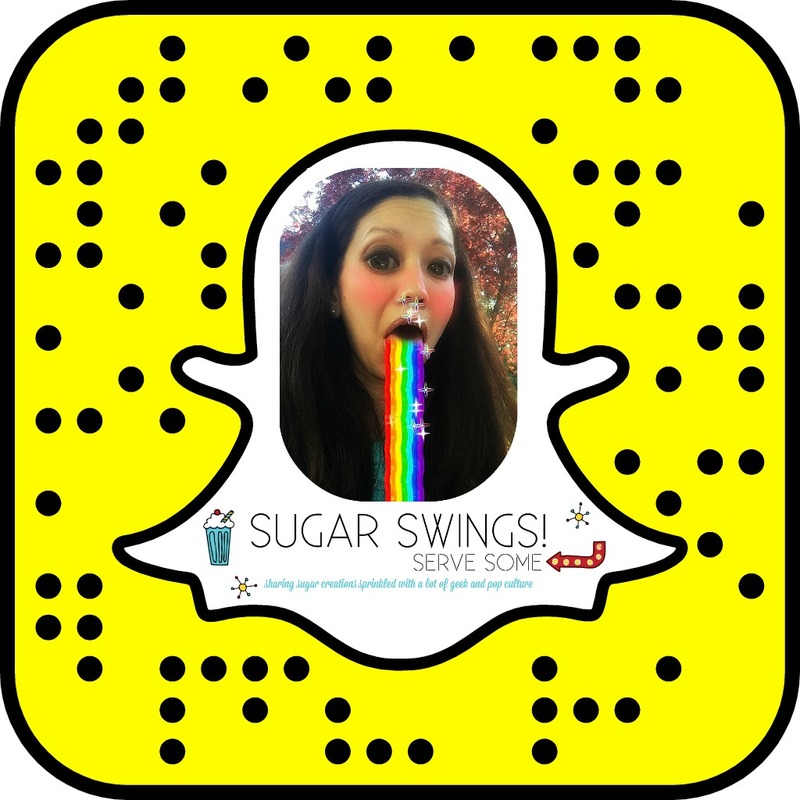 Thanks for sharing on Crazy Sweet Tuesday! 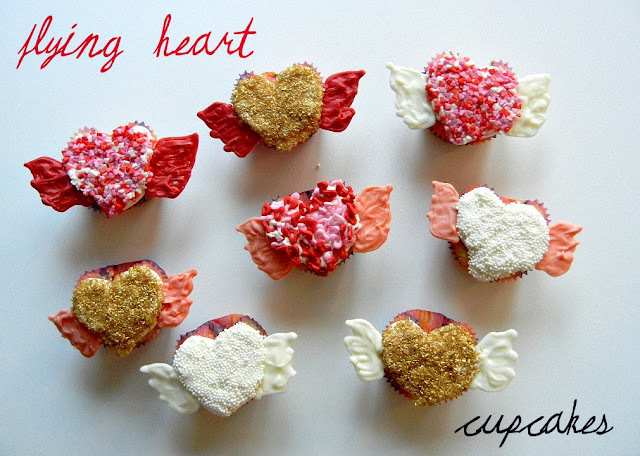 I'm flipping over your flying heart cupcakes, omg, they are cute, what a genius to create heart shape by using marbles!!! I was out looking for recipes to celebrate my own Happy Heart Attack Day on January 24th, and I found your blog. It just made me smile. How can you NOT celebrate a day that helps to restore your life? I don't have a donor to thank, but I had experimental heart surgery 11 years ago. They injected alcohol into my heart to cause 2 heart attacks, thinning my heart wall that was too thick. I don't have a donor to thank, so instead I'll send a prayer to your donor's family, your little girls and you on my anniversary. And I'll give two extra big hugs to my two little girls. Without that surgery, I'd never have been allowed to have those little miracles. Happy Heart Day to you, and Happy Heart Attack Day to me! awesome!! happy heart attack day to you!! (glad it's a day you can celebrate, and thanks for the sweet comment). Much appreciated. So cute, and I am so happy that your little one is here, donors are amazing! 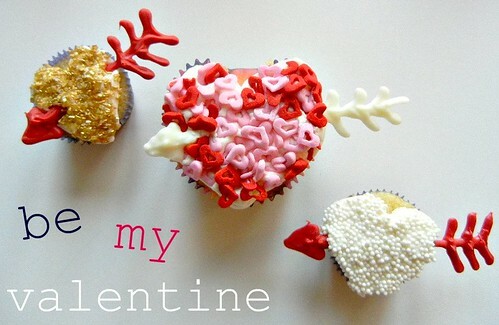 Love your cupcakes! And so happy your little one is doing well! Oh...I just love these too! Great idea! Those are SO sweet! I too loved that Bakerella post - I'm so glad that she laid it all out there like that. I'm so happy for you that your little one is doing so well! That must be the best Valentine's present. 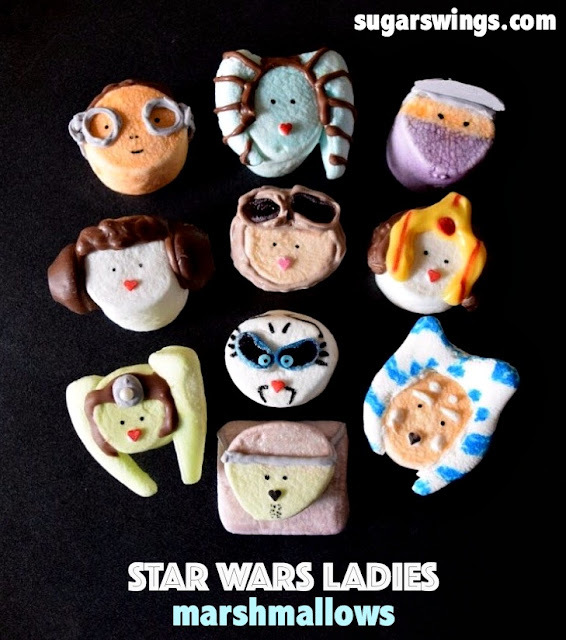 Adorable cupcakes!... love the idea for putting a marble in between the liner and pan! Your cupcakes are so cute! And so yummy I bet! Putting a marble in the muffin tins is genius! Thanks for the tip! Very cute! I love the wings! These are adorable! Incredible idea to use the marbles. Can't wait to try them. Just found your blog and I'm a new follower. I look forward to more of your creativity. I agree re: donors and I signed my card years & years ago. It's such an amazing gift for someone else to live on. Loved your flying cup cakes. Very cute. I am going to try them for sure . plus I am going to pin your post in my blog for my coming post. Please do visit my blog and let me know how you like it. So cute. This is great for kids. matcha and cherry chip cookies....!